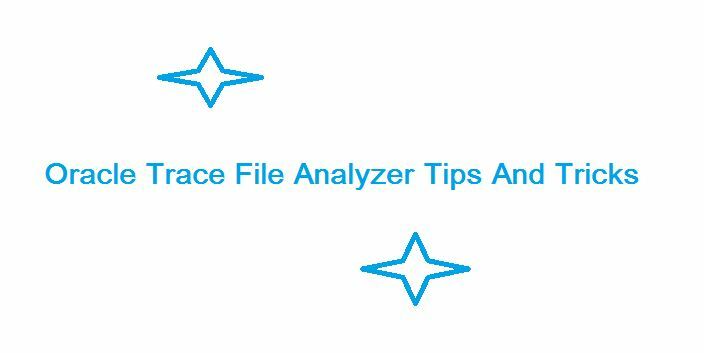 Trace File Analyzer is new utility which can be installed on the database nodes either stand alone or cluster nodes. In order to collect the diagnostics of 8 node for example, then we have to review alert log, listener logs whatever on all the nodes that become very lengthy procedure and also not easy to merge the information based on the all nodes. 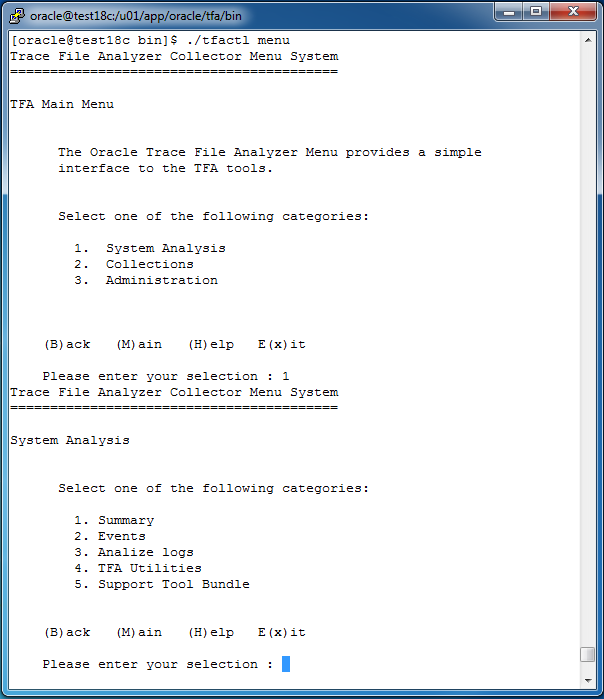 Hence Oracle introduced TFA – Trace file analyzer and this made easy job for DBA’s, TFA utility or bundle can be downloaded from MOS. Data collections completed. Checking best practices on test18c. Starting from 12.2 this bundle is included with RDBMS software and again this is optional when we run the root.sh script, still we can skip this if it’s not required. we will see how to initiate the TFA when we run the root.sh of RDBMS. If we crack the log file then we can see very much detailed information such as scanned trace directories, number of hosts and with the help preview. - Collecting ACFS details ... Done. - Collecting DATABASE details ... Done. - Collecting PATCH details ... Done. - Collecting LISTENER details ... Done. - Collecting NETWORK details ... Done. - Collecting OS details ... Done. - Collecting TFA details ... Done. - Collecting SUMMARY details ... Done. We can access the list of commands using the “tfactl <command> -help“, in this example we will collect sample diagnostic data using TFA. 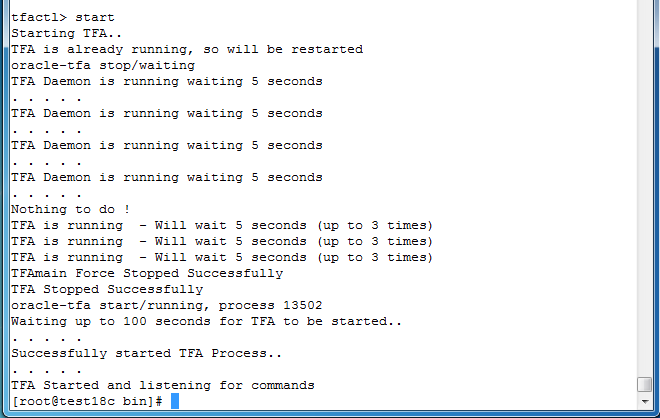 How to check whether TFA is running or not? tfactl start: Starts the Oracle Trace File Analyzer daemon on the local node. tfactl stop: Stops the Oracle Trace File Analyzer daemon on the local node. 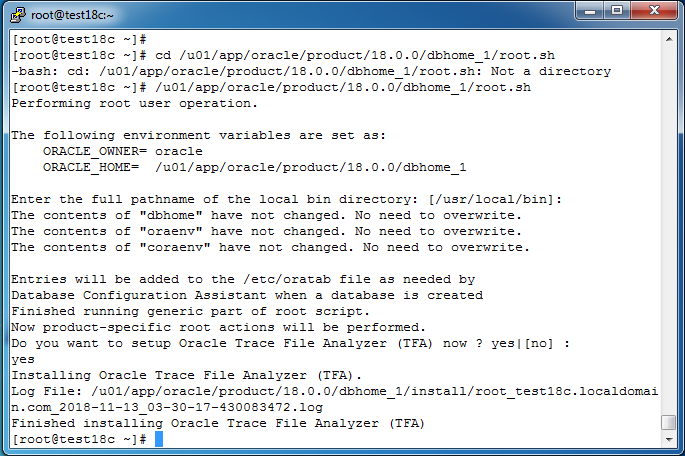 tfactl enable: Enables automatic restart of the Oracle Trace File Analyzer daemon after a failure or system reboot. 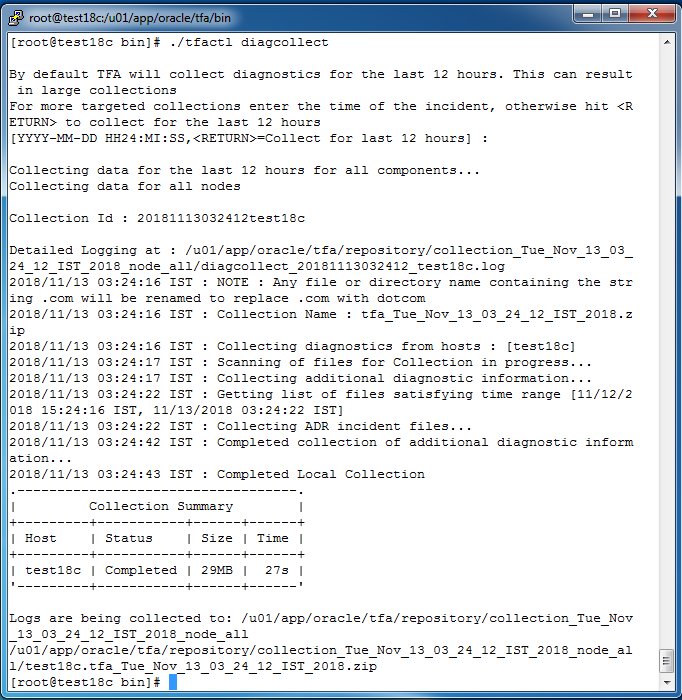 tfactl disable: Stops any running Oracle Trace File Analyzer daemon and disables automatic restart. 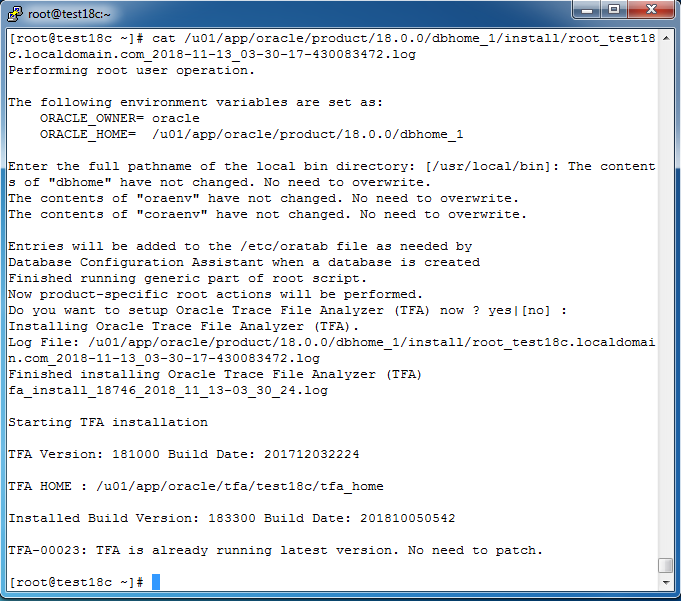 tfactl uninstall: Removes Oracle Trace File Analyzer from the local node. tfactl syncnodes: Generates and copies Oracle Trace File Analyzer certificates from one Oracle Trace File Analyzer node to other nodes. tfactl restrictprotocol: Restricts the use of certain protocols. 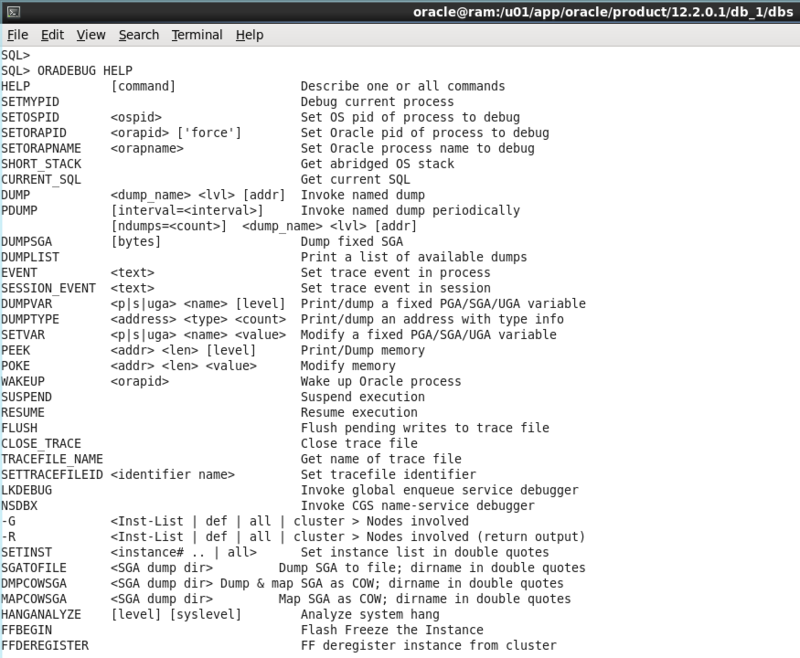 tfactl status: Checks the status of an Oracle Trace File Analyzer process. The output is same as tfactl print status. 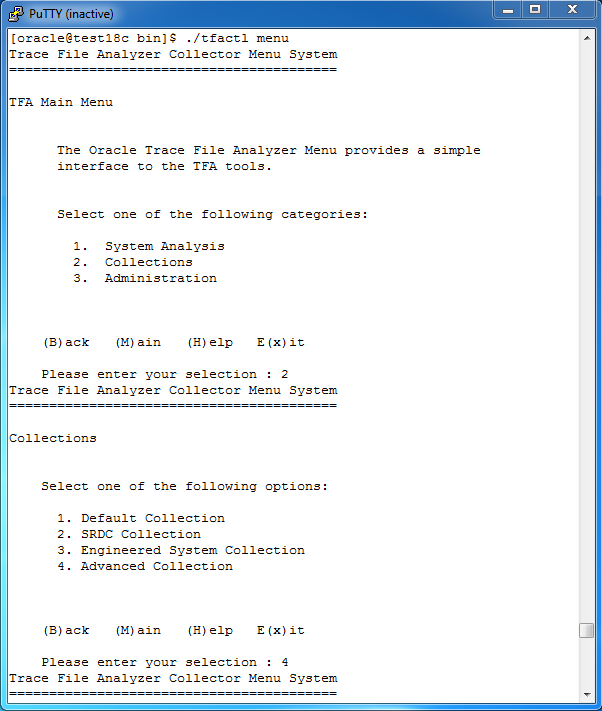 tfactl diagnosetfa: Use the tfactl diagnosa tfa command to collect Oracle Trace File Analyzer diagnostic data from the local node to help diagnose issues with Oracle Trace File Analyzer. tfactl host: Use the tfactl host command to add hosts to, or remove hosts from the Oracle Trace File Analyzer configuration. 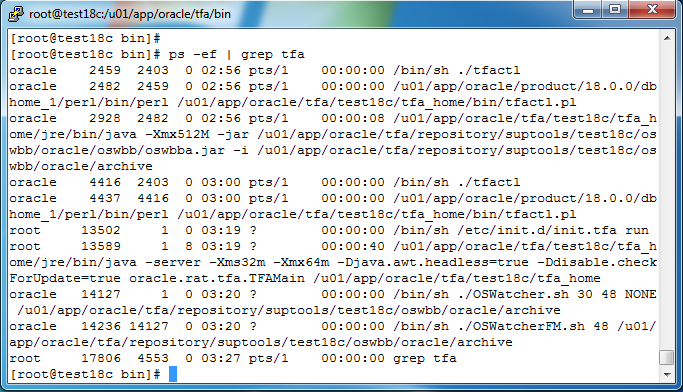 tfactl set: Use the tfactl set command to enable or disable, or modify various Oracle Trace File Analyzer functions. 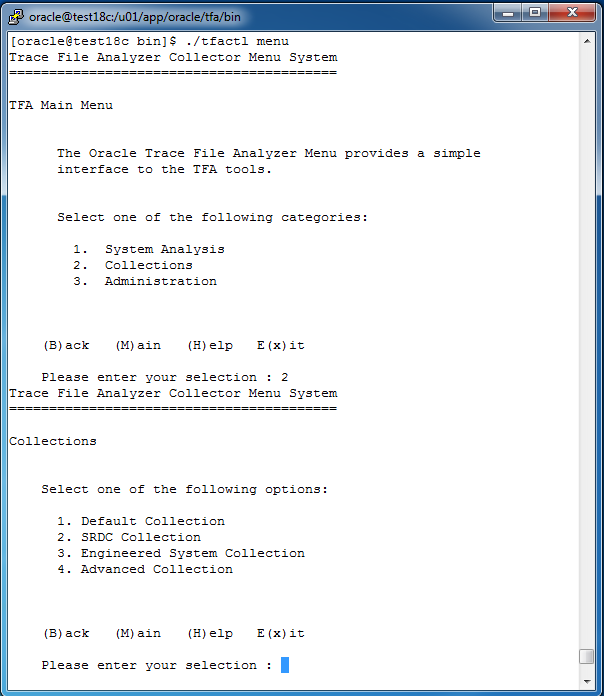 tfactl access: Use the tfactl access command to allow non-root users to have controlled access to Oracle Trace File Analyzer and to run diagnostic collections. The SQL Tuning Advisor takes one or more SQL statements as an input and invokes the Automatic Tuning Optimizer to perform SQL tuning on the statements. 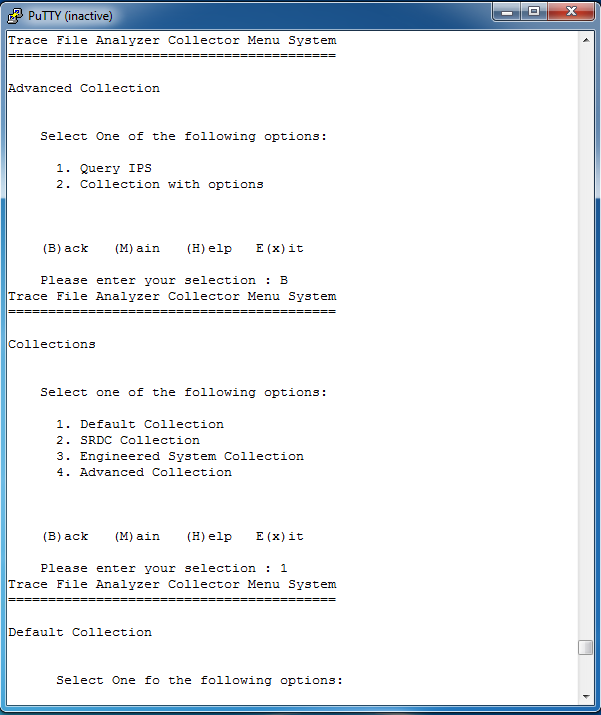 The output of the SQL Tuning Advisor is in the form of an recommendations, along with a rationale for each recommendation and its expected benefit.The recommendation relates to collection of statistics on objects, creation of new indexes, restructuring of the SQL statement, or creation of a SQL profile. You can choose to accept the recommendation to complete the tuning of the SQL statements. You can also run the SQL Tuning Advisor selectively on a single or a set of SQL statements that have been identified as problematic. Find the problematic SQL_ID from v$session you would like to analyze. Usually the AWR has the top SQL_IDs column. Check the status is completed for the task and we can get recommendations of the advisor. Check the PLAN_HASH_VALUE got changed for the specific statement and get SNAP_ID to create a tuning task. Create,Execute and Report the task from given AWR snapshot IDs. SQLT is a set of packages and scripts that produces HTML-formatted reports, some SQL scripts and some text files. SQLTXPLAIN is tool to enable users to analyze and tune the performance of a single SQL statement. The entire collection of information is packaged in a zip file and often sent to Oracle Support, but you can look at these files yourself. There are just over a dozen packages and procedures (called “methods”) in SQLT. These packages and procedures collect different information based on your circumstances. These files are commonly used to diagnose SQL statements performing poorly. 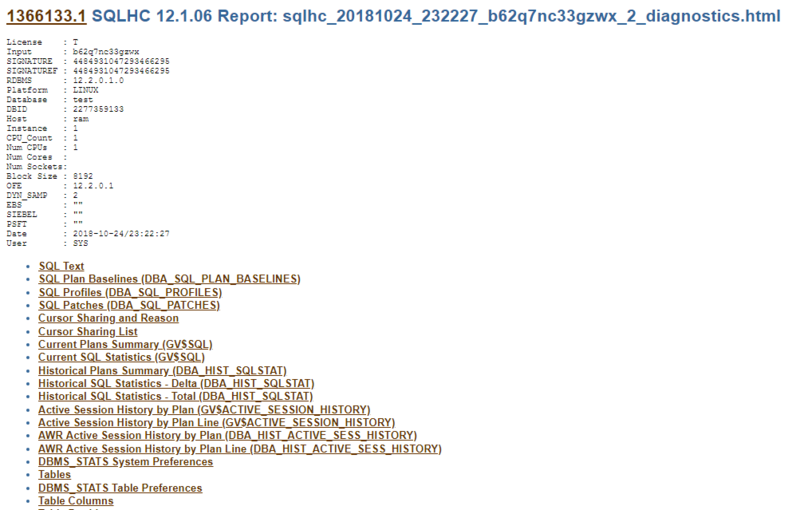 SQLT connects to the database and collects execution plans, Cost-based Optimizer CBO statistics, schema objects metadata, performance statistics, configuration parameters, and similar elements that influence the performance of the SQL being analyzed. Click the Download SQLTXPLAIN of your database version. Unzip the SQLT (sqlt_10g_11g_12c_25_08_2018.zip) zip file. Unzip the zip file to suitable location. If not applicable, enter nothing and hit the "Enter" key. repository everytime you execute one of the main methods. Define SQLTXPLAIN password (hidden and case sensitive). The Tablespace name is case sensitive. or is it ok just to show the list of tablespace [NO]? Specify PERMANENT tablespace to be used by SQLTXPLAIN. Tablespace name is case sensitive. Specify TEMPORARY tablespace to be used by SQLTXPLAIN. owner that issued the SQL to be analyzed. You will not be asked to enter its password. Installing required packages to support SQLT. Migrating relevant objects from old to new repository. Taking snapshots of some existing data dictionary objects. SQLT provides 7 main methods that generate diagnostics details for one SQL statement: XTRACT, XECUTE, XTRXEC, XTRSBY, XPLAIN, XPREXT and XPREXC. 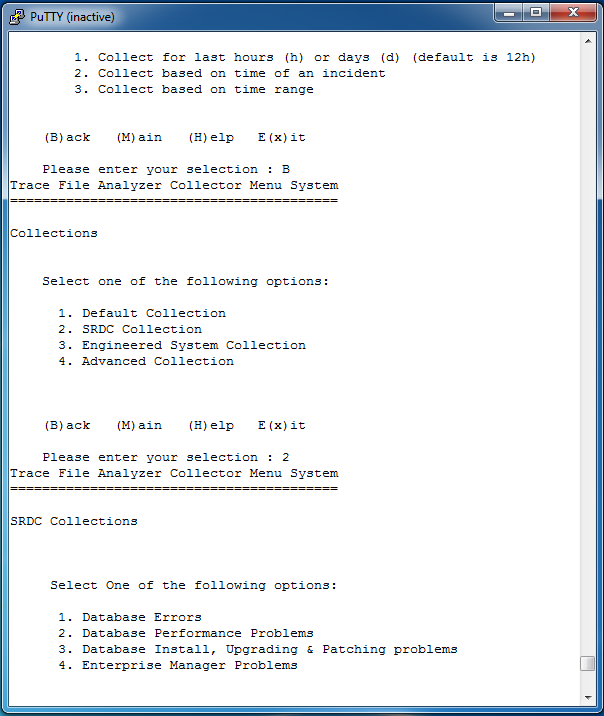 Select appropriate method to diagnose the SQL statement. Use this method if you know the SQL_ID or the HASH_VALUE of the SQL to be analyzed, else use XECUTE method. The SQL_ID can be found on an AWR report, and the HASH_VALUE on any SQL Trace. Run the SQLT report from the HARI or respective user. *** PLS-00201: identifier 'SQLTXADMIN.SQLT$A' must be declared. *** In such case look for errors in NN_*.log files created during install. You used the XTRACT method connected as HARI. 1. There are no errors in sqltxtract.log. 2. Your SQL 8x615vyks733p exists in memory or in AWR. 3. You connected as the application user that issued original SQL. 4. User HARI has been granted SQLT_USER_ROLE. a disconnect when executed a second time. of the disconnect is fixed then reset SQLT corresponding parameter. ### tkprof commands below may error out with "could not open trace file". disregard error. ### copy command below will error out on linux and unix. disregard error. ### chmod command below will error out on windows. disregard error. ### ls commands below will error out on windows. disregard error. ### who command below will error out on windows. disregard error. File sqlt_s81018_xtract_8x615vyks733p.zip for 8x615vyks733p has been created. sqlt_s81018_sqldx_8x615vyks733p_driver.sql file has been created. sqlt_s81018_sqldx_*.zip files have been created. The SQLT has collected information and place it in a repository in the database, exported it and zip it. 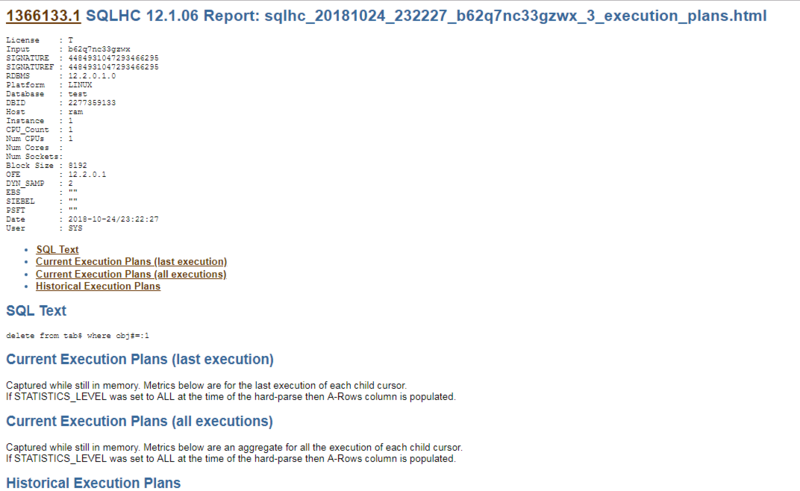 Open the sqlt_s81018_main.html report and start the performance analysis. It will execute the SQL statements and get analyzed.Its major drawback is that if the SQL being analyzed takes long to execute, this method will also take long. You used the XECUTE method connected as HARI. 1. There are no errors in sqltxecute.log or sqltxecute2.log. 2. Your SQL contains token "^^unique_id" within a comment. 3. Your SQL ends with a semi-colon ";". 4. You connected as the application user that issued original SQL. 6. User HARI has been granted SQLT_USER_ROLE. File sqlt_s81019_xecute.zip for user_objects.sql has been created. sqlt_s81019_sqldx_0d7hz8d1y5vw6_driver.sql file has been created. sqlt_s81019_sqldx_*.zip files have been created. It is a combination feature of XTRACT and XECUTE for DBA. First XTARCT generates a script that contains extracted SQL and expensive plan found for requested statement. XTRXEC then executes the XECUTE phase using the script created before. This method only need SQL_ID/Hash value and sqltxplain_password. This method is most commonly and recommended method for SQL Performance related tuning issues. 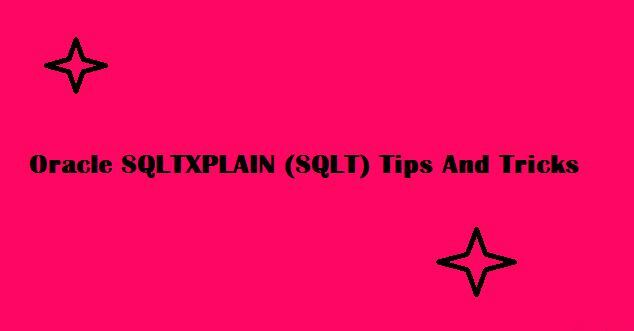 This method is based on the EXPLAIN PLAN FOR command, therefore it is to bind variables referenced by your SQL statement. Use this method only if XTRACT or XECUTE are not possible. You are using SQLT XPLAIN method. XTRACT or XECUTE, then do not use this XPLAIN method. XPLAIN might not be useful to progress your issue. File sqlt_s81023_xplain.zip for /home/oracle/sqlt/run/user_objects.sql has been created. sqlt_s81023_sqldx_0d7hz8d1y5vw6_driver.sql file has been created. sqlt_s81023_sqldx_*.zip files have been created. Use this method if you need to analyze a SQL executed on a Data Guard or stand-by read-only database. You need to know the SQL_ID or the Hashvalue of the SQL to be analyzed. Create on Primary database a link to read-only database connecting as any user that has access to the data dictionary. we need DBA privileges access to do it. If the SQL is still in memory in the read-only database, then XTRSBY finds it and provides a set of diagnostics files, else XTRSBY errors out. To use this XTRSBY method, be sure SQLT has been installed on the Primary first, and replicated into the read-only database. Oracle utility is called oradebug. This tool is primarily used by Oracle worldwide customer support .With oradebug utility you can literally see the database engine. The oradebug is especially useful when things go very bad – e.g. the database just stops, hangs, or the database keeps crashing with the ORA-0600 error! To run this tool you must have administrator privileges. – enabling/disabling the SQL tracing for another user’s session. – wake up processes etc. Modify memory. Never perform this function on a production database! Do not use as it often fails. Use setorapid instead. The ADR is a file-based repository for database diagnostic data such as traces, dumps, the alert log, health monitor reports, and more. It has a unified directory structure across multiple instances and multiple products. 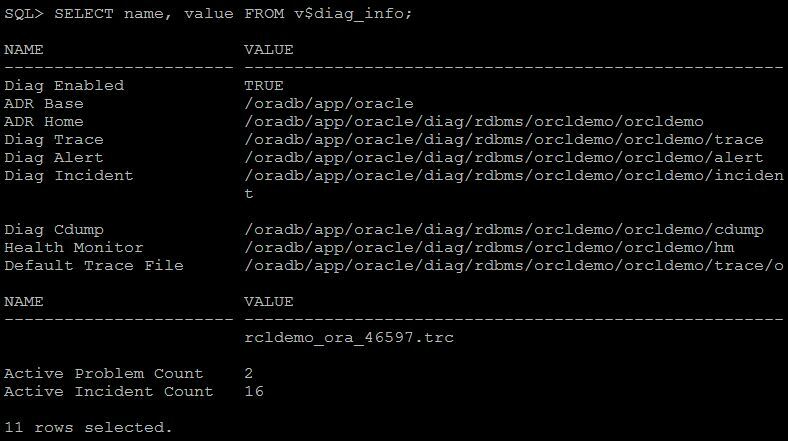 Beginning with Release 11g, the database, Automatic Storage Management (ASM), and other Oracle products or components store all diagnostic data in the ADR. Each instance of each product stores diagnostic data underneath its own ADR home directory. For example,In an Oracle Real Application Clusters environment with shared storage and ASM, each database instance and each ASM instance has a home directory within the ADR. The ADR’s unified directory structure enables customers and Oracle Support to correlate and analyze diagnostic data across multiple instances and multiple products. Most of the diagnostic logs stored in the admin directory in Oracle 10g and earlier has now been moved to the Automatic Diagnostic Repository,or ADR directory, in Oracle 11g. The ADR directory is created in $ORACLE_BASE/diag and contains a subdirectory for each different Oracle installation type on the system and may also contain some empty directories for products which are not installed. Within the database, the ADR location is defined by the diagnostic_dest initialization parameter, and the background_dump_dest, user_dump_dest and similar parameters have been deprecated. One is present in the conventional text format, per OFA in $ORACLE_BASE/diag/rdbms/name of the db/name of the instance/trace This location is determined by the new initialization parameter DIAGNOSTIC_DEST, while BACKGROUND_DUMP_DEST is deprecated in 11g. The other one is in XML format placed in $ORACLE_BASE/diag/rdbms/name of the db/name of the instance/alert. Warning: VKTM detected a forward time drift. Time drifts can result in unexpected behavior such as time-outs. adrci> show alert -p "message_text like '%incident%'"
To directly viewed the trace file using the SHOW_TRACE command. A problem is a critical error in the database. Critical errors include internal errors such as ORA-00600 and other severe errors such as ORA-07445 (operating system exception) or ORA-04031 (out of memory in the shared pool). Problems are tracked in the ADR. Each problem has a problem key and a unique problem ID. Incidents are flood-controlled so that a single problem does not generate too many incidents and incident dumps. A package is a logical construct only, until you create a physical file from the package contents. That is, an incident package starts out as a collection of metadata in the Automatic Diagnostic Repository (ADR). As you add and remove package contents, only the metadata is modified. When you are ready to upload the data to Oracle Support, you create a physical package using ADRCI, which saves the data into a zip file. Get Problem ID from incident output. 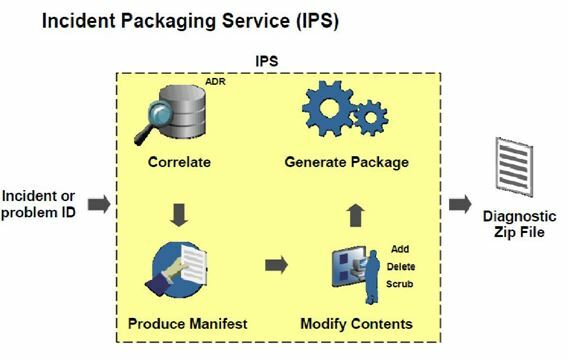 Gather all the required information with a method called “Incident Packaging Service” (IPS). 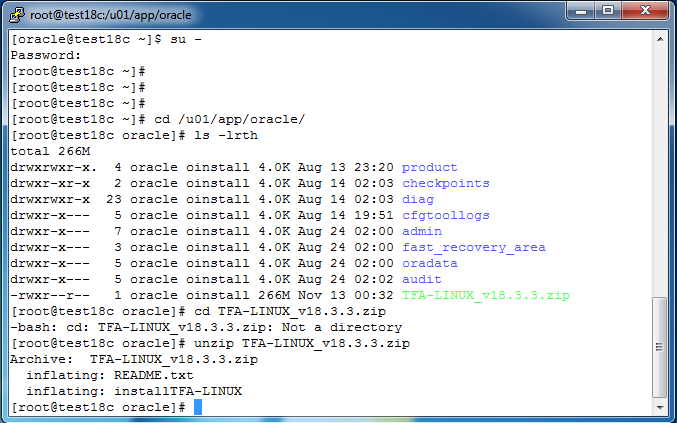 adrci> ips generate package 1 in "/home/oracle"
The package is now zipped and ready to upload to Oracle Support. Created package 10 based on incident id 3, correlation level typical The package number assigned to this logical package is 10. This creates a package and includes diagnostic information for incidents that reference the specified problem ID. This creates a package and includes diagnostic information for all incidents that occurred within the specified time range. start_time and end_time must be in the format ‘YYYY-MM-DD HH24:MI:SS.FF TZR’. This is a valid format string for the NLS_TIMESTAMP_TZ_FORMAT initialization parameter. Before ADRCI can generate a physical package from a logical package, the package must be finalized. This means that other components are called to add any correlated diagnostic data files to the incidents already in this package. Finalizing also adds recent trace files, alert log entries, Health Monitor reports, SQL test cases, and configuration information. This step is run automatically when a physical package is generated, and can also be run manually using the ADRCI utility. After manually finalizing a package, you can review the files that were added and then remove or edit any that contain sensitive information. 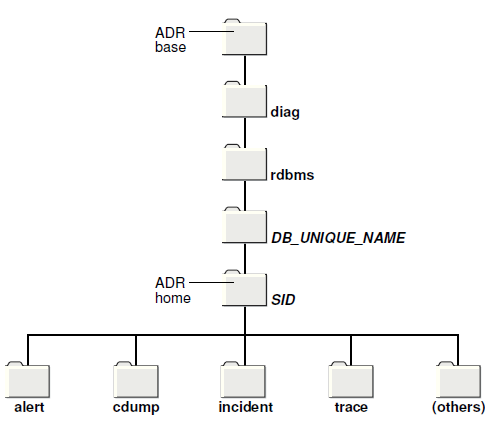 An ADR home is the root directory for all diagnostic data—traces, dumps, alert log, and so on—for a particular instance of a particular Oracle product or component. For example, in a Real Application Clusters environment with ASM, each database instance and each ASM instance has an ADR home. All ADR homes share the same hierarchical directory structure. Some of the standard subdirectories in each ADR home include alert (for the alert log), trace (for trace files), and incident (for incident information). All ADR homes are located within the ADR base directory. Some ADRCI commands can work with multiple ADR homes simultaneously. The current ADRCI homepath determines the ADR homes that are searched for diagnostic data when an ADRCI command is issued. To permit correlation of diagnostic data across multiple ADR homes, ADR homes are grouped together under the same root directory called the ADR base. For example, in an Oracle Real Application Clusters (RAC) environment, the ADR base could be on a shared disk, and the ADR home for each Oracle RAC instance could be located under this ADR base. The location of the ADR base for a database instance is set by the DIAGNOSTIC_DEST initialization parameter. If this parameter is omitted or is null, the database sets it to a default value. When multiple database instances share an Oracle home, whether they are multiple single instances or the instances of an Oracle Real Application Clusters database, and when one or more of these instances set ADR base in different locations, the last instance to start up determines the default ADR base for ADRCI. All ADRCI commands operate on diagnostic data in the “current” ADR homes. More than one ADR home can be current at any one time. Some ADRCI commands (such as SHOW INCIDENT) search for and display diagnostic data from all current ADR homes, while other commands require that only one ADR home be current, and display an error message if more than one is current. 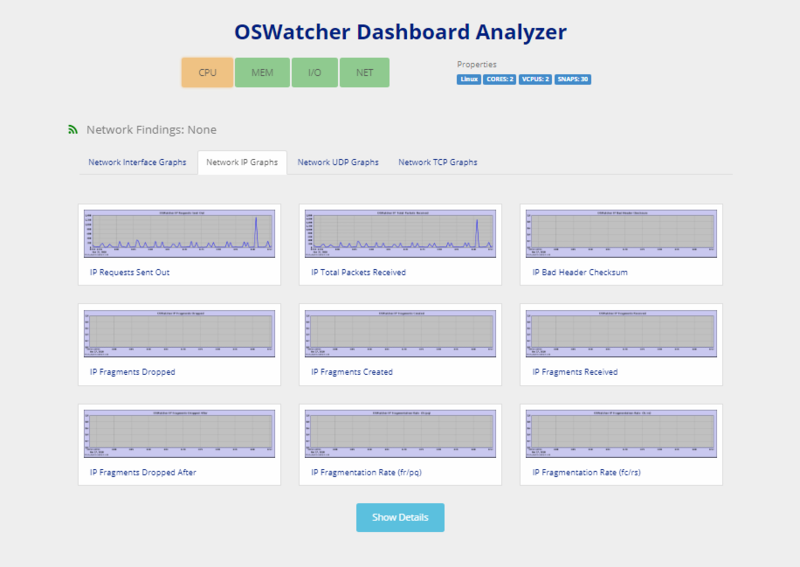 Oracle OSWatcher Black Box (OSWbb) collects and archives operating system and network metrics that you can use to diagnose performance issues. 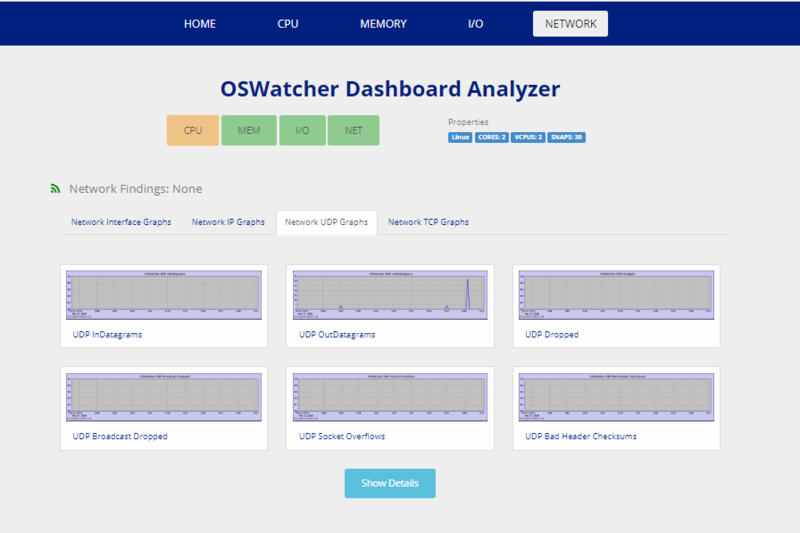 OSWbb operates as a set of background processes on the server and gathers data on a regular basis, invoking such Unix utilities as vmstat, netstat, iostat, and top. OSWatcher includes a File Manager process that will run once per hour to clean up any data files older than the retention period. The collection interval and retention period can be changed with the first two parameters, respectively, to the shell script that starts OSWatcher. OSWbb is particularly useful for Oracle RAC (Real Application Clusters) and Oracle Grid Infrastructure configurations. The RAC-DDT (Diagnostic Data Tool) script file includes OSWbb, but does not install it by default. Download the file oswbb601.tar, which is available at https://support.oracle.com/epmos/main/downloadattachmentprocessor?attachid=301137.1:OSW_file. If the ksh package is not already installed on your system, use yum to install it. Info...You did not enter a value for snapshotInterval. Info...You did not enter a value for archiveInterval. TRACEROUTE found on your system. To stop OSWbb permanently, run the stopOSWbb.sh script from the oswbb directory. Collected data will be stored under archive directory, it is created when OSWbb is started for the first time. OSWbb stores data in hourly archive files named system_name_utility_name_timestamp.dat, and each entry in a file is preceded by the characters *** and a timestamp. To check any data, just navigate to corresponding directory and view the corresponding file. For testing purpose, we printed vmstat file output. 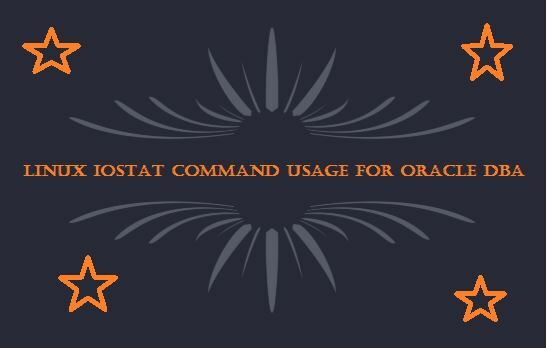 oswiostat Contains output from the iostat utility. oswmeminfo Contains a listing of the contents of /proc/meminfo. oswmpstat Contains output from the mpstat utility. oswnetstat Contains output from the netstat utility. oswprvtnet If you have enable private network tracing for RAC, contains information about the status of the private networks. oswps Contains output from the ps utility. 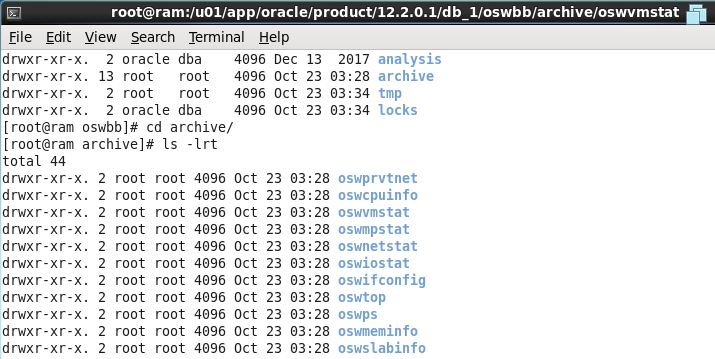 oswslabinfo Contains a listing of the contents of /proc/slabinfo. oswtop Contains output from the top utility. 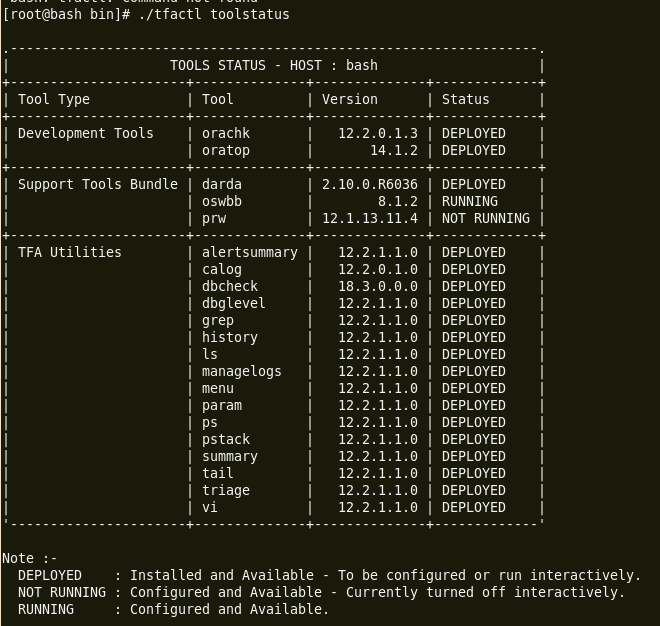 oswvmstat Contains output from the vmstat utility. No Grid Infrastructure Discovered on this system . . . . .
A new analysis file analysis/<CR>/analysis.txt has been created. If you choose option “D” oswbb will go ahead and create a dashboard. 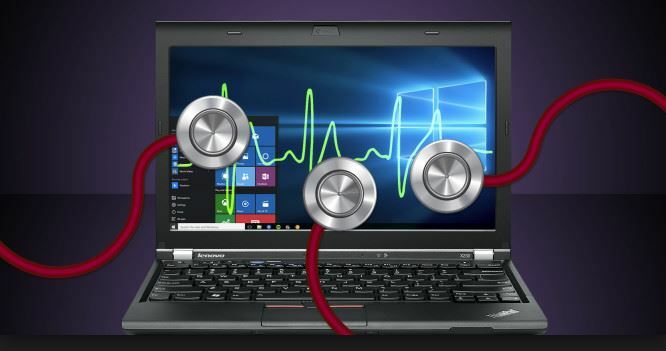 The SQL Tuning Health-Check Script is a tool developed by the Oracle Server Technologies Center of Expertise. The tool, also known as SQLHC, is used to check the environment in which a single SQL Statement runs, checking Cost-based Optimizer (CBO) statistics, schema object metadata, configuration parameters and other elements that may influence the performance of the one SQL being analyzed. Overview: SQLHC checks elements that may affect the performance of the SQL being analyzed, such as Cost-based Optimizer (CBO) statistics, schema object metadata, configuration parameters. SQLHC is a subset of SQLT, which we will discuss next. This script is a quick way to diagnose problems without having SQLT installed. Proactive: Use this script to examine SQL that is not running up to standards while testing an upgrade. Reactive: Use this script to get recommendations on problem SQL after an upgrade. Caveats: SQLHC does not require any special licensing, it is free and it is designed to run on all systems. If the Diagnostics and Tuning packs are installed, that data will be used by the script. If you are not licensed for Diagnostics and Tuning, answer “NO” to that question in the script to avoid licensing problems. Login to the database server and set the environment used by the Database Instance. Download the “sqlhc.zip” archive file and extract the contents to a suitable directory/folder. A valid SQL_ID for the SQL to be analyzed. I attached the output files here. ORAchk replaces the RACCheck utility. 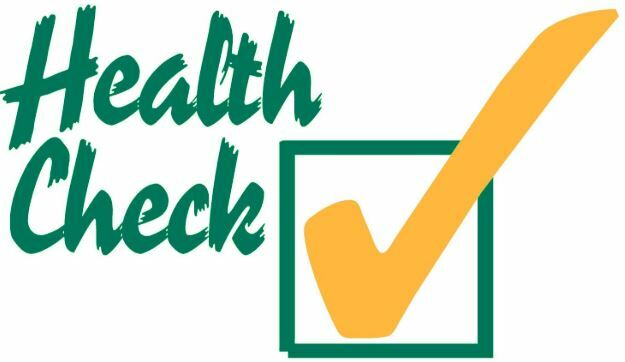 ORAchk extends health check coverage to the entire Oracle software stack, and identifies and addresses top issues reported by Oracle users. Oracle is continuing to expand checks, based on customer requests. 23193819 request orachk to check udev best practice on network configuration hotplug="n"
For a full list of ORAchk version history see ORAchk_EXAchk_Feature_Fix_History.pdf in the doc directory. Reproduce the problem with fewest runs before enabling debug. 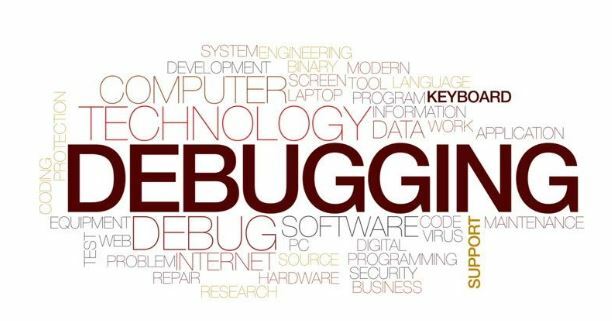 Debug captures a lot and the resulting zip file can be large so try to narrow down the amount of run necessary to reproduce the problem. Use command-line options to limit the scope of checks. Verify that the permissions on the tools scripts orachk is set to 755 (-rwrr-xr-x). 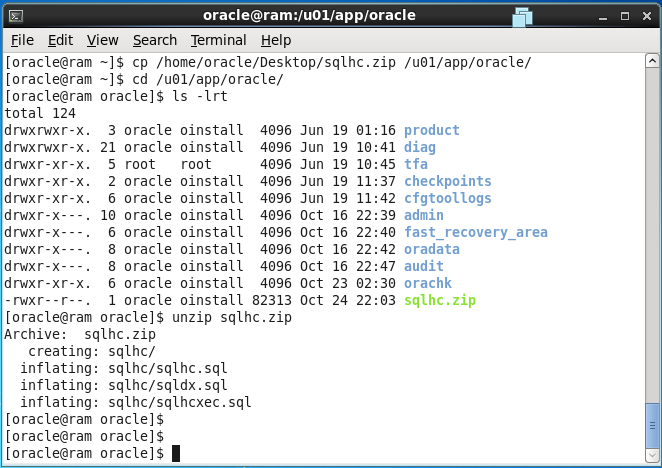 Oracle Trace File Analyzer root installations on Linux or Solaris on non-engineered systems will automatically setup and run the ORAchk daemon. The daemon will be restarted at 1am every morning, in order to discover any environment changes. A full local ORAchk run will be performed at 2am every morning and a partial run of the most impactful checks will be run every 2 hours via the oratier1 profile. This version of orachk was released on 26-May-2016 and its older than 120 days. No new version of orachk is available in RAT_UPGRADE_LOC. It is highly recommended that you download the latest version of orachk from my oracle support to ensure the highest level of accuracy of the data contained within the report. updates.oracle.com is not reachable. Please establish connectivity to updates.oracle.com and try again. Invalid upgrade target version format or upgrade version not yet supported. Source vesrsion (122010) is higher than Target version (121020). To avoid problems while running the tool from terminal sessions on a network attached workstation or laptop, consider running the tool using VNC. If there is a network interruption, then the tool continues to process to completion. If the tool fails to run, then re-run the tool. The tool does not resume from the point of failure. To start on-demand health check runs, log in to the system as an appropriate user, and then run an appropriate tool. Specify the options to direct the type of run that you want. Data collections completed. Checking best practices on ram. WARNING => OSWatcher is not running as is recommended. Best Practice checking completed.Checking recommended patches on ram. After i run the ORAchk utility i got few output from my server which i added below. When running on-demand, if the daemon is running, then the daemon answers all prompts where possible including the passwords. Daemon mode is supported only on the Linux and Solaris operating systems. Optionally email the HTML report to one or more recipients using the -sendemail option. [oracle@ram orachk]$ ./orachk -sendemail "NOTIFICATION_EMAIL=support@gmail.com"
To prevent prompting for which database to run against and check all databases, use the –dball option. To prevent prompting and skip all database checks, use the –dbnone option. To run checks against a subset of databases, use the –dbnames database_name option. You can check multiple database instances by listing them in a comma-delimited list. 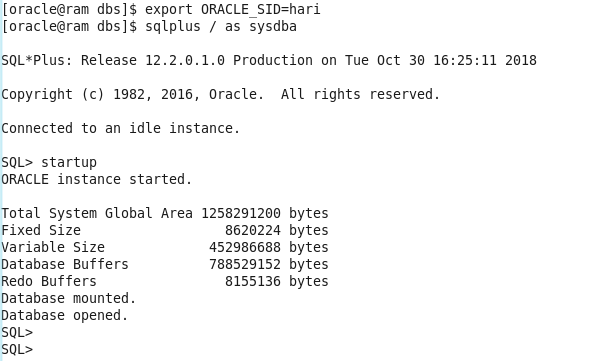 By default, Oracle ORAchk run checks on all database nodes in the cluster. To run checks against a subset of PDBs, use the -pdbnames pdb_name option. You can check multiple PDBs by listing them in a comma-delimited list. 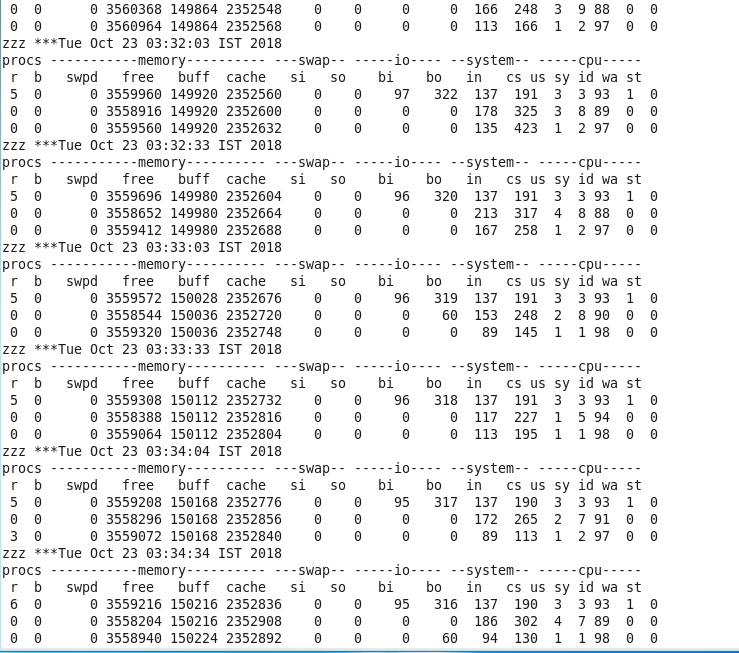 By default, Oracle ORAchk run checks on all PDBs in the cluster. To run checks against a subset of cluster nodes, use the -clusternodes node option. You can check multiple cluster nodes by listing them in a comma-delimited list. To run checks against the local node, use the -localonly option. It displays information about CPU usage, and I/O statistics for every partition and network filesystems(NFS).It is default size is in KB. -c Display the CPU utilization report. -d Display the device utilization report. -h Make the NFS report displayed by option -n easier to read by a human. -k Display statistics in kilobytes per second instead of blocks per second. Data displayed are valid only with kernels 2.4 and later. -m Display statistics in megabytes per second instead of blocks or kilobytes per second. Data displayed are valid only with kernels 2.4 and later. -N Display the registered device mapper names for any device mapper devices. 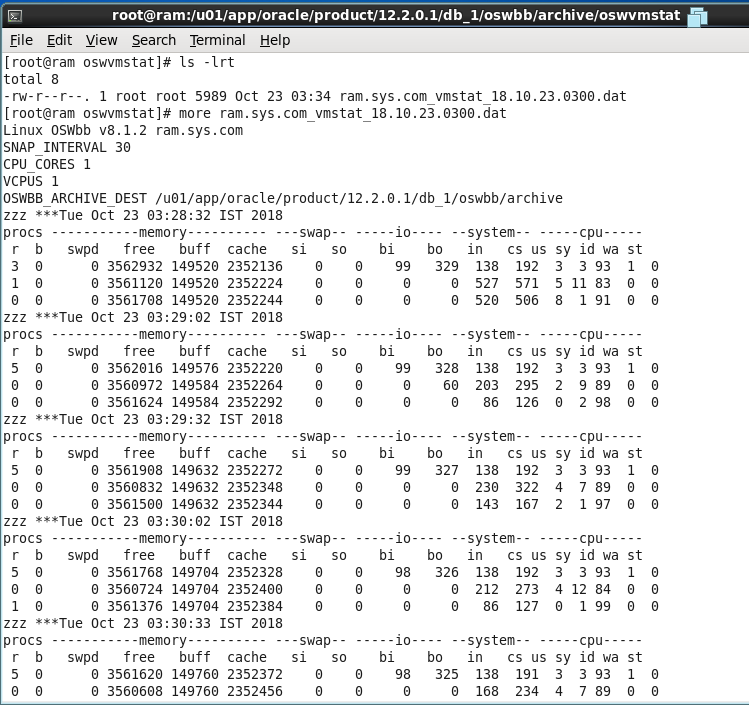 Useful for viewing LVM2 statistics. -n Display the network filesystem (NFS) report. This option works only with kernel 2.6.17 and later. The -p option displays statistics for block devices and all their partitions that are used by the system. If a device name is entered on the command line, then statistics for it and all its partitions are displayed. Last, the ALL keyword indicates that statistics have to be displayed for all the block devices and partitions defined by the system, including those that have never been used. Note that this option works only with post 2.5 kernels. -t Print the time for each report displayed. The timestamp format may depend on the value of the S_TIME_FORMAT environment variable (see below). -x Display extended statistics. This option works with post 2.5 kernels since it needs /proc/diskstats file or a mounted sysfs to get the statistics. This option may also work with older kernels (e.g. 2.4) only if extended statistics are available in /proc/partitions (the kernel needs to be patched for that). -z Tell iostat to omit output for any devices for which there was no activity during the sample period. 3. iostat with -c arguments displays only CPU statistics for every 2 seconds. 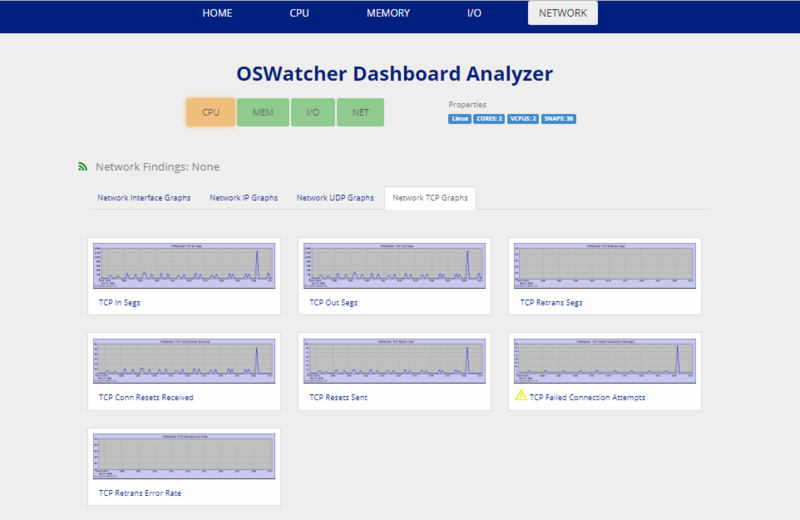 The iostat command generates three types of reports, the CPU Utilization report, the Device Utilization report and the Network Filesystem report.